When Dale Stevenson and I get together, we always spend some time discussing people, performance and philosophy. Dale was nice enough to share the below excerpt, and it triggered a strong enough reason to write this post. When you run as fast as you do what does it feel like? Is there a physical or a metaphysical sensation – a music or rhythm to mind and body? “It does feel rhythmic. Sprinting is all about establishing a rhythm and running in that rhythm. You’re pushing and accelerating and it is a rhythm. 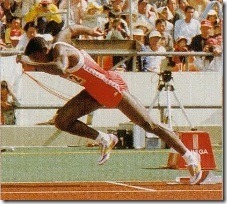 At the same time it’s a total contradiction because while sprinting is pure acceleration , it’s also total relaxation. You should always feel like you’re on the edge of control. That’s how I am. Others may feel different; may feel stronger or run differently. When a generational talent like Carl Lewis shares insights from his experience, it creates an opportunity to contrast with our own experiences of running at full speed, while also considering whether the the wisdom of moving is a mirror to other important understanding in life. In other words perform the task in order to begin to understand the task experientially. After some repetition, you begin to develop some familiarity with the patterns inherent in the task. When this familiarity becomes embodied, we can begin to perform the task at speed. Good cortical function implies good inhibition. Most of our receptors in the CNS are for inhibition. We therefore need to be able switch between activation and relaxation. Not just activate, but activate while being able to relax the rest. Postural adaptation and selective movement are inter-related, we need to be able recruit ideally for the task, with ability to adjust quickly. This explains why moving well is so cognitively demanding in the initial phases of learning. All of the drills and exercises we do are supportive of training the above 5 factors if indeed we are training with awareness of the interdependence of body and brain. So back to Carl Lewis finding; being on the edge of control implies finding a boundary where another change would mean a decrement in performance, yet this dynamic actuality has to be explored, and once found attended to in real-time. This finding does not represent anything fixed, rather being familiar with one’s easy top speed is the necessary stimulus for further adaptation.